As I write this, I’m sitting in the Dallas airport waiting for my flight to board. I’m on the tail end of a truly wonderful weekend of teaching at the Craft Guild of Dallas. 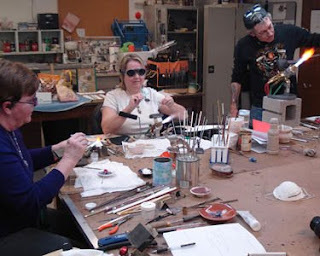 This class has been in the works for quite some time; a few Guild members took one of my classes at the 2009 Glass Craft and Bead Expo, and wanted to bring me out to Dallas to continue the beadmaking fun we had in Vegas. So, after almost a year of planning and scheduling, we decided on 3 days, in 2 parts: my 2 day Shaping, Encasing, and Color class, along with a 1 day optional add-on class that covered how I use enamels to create un-glassy effects with glass. (This has since become the Un Glassy Glass Class, coming up at 2010 GCE in Vegas, and in May at Brea Bead Works). Oh my, we had a BLAST. This is the first time I’ve been lucky enough to have the same group of students for 3 continuous days, and it was so nice to get to see my students really sink their teeth into the class. I can’t wait to see pictures from the last round of beads we made on Sunday in the enamels class: sculpted Roman-glass-looking vessels, textured rocks, and marbles are what I’m particularly excited to see. What makes the Guild awesome? Lots. It’s been around for more than 50 years, teaching classes in lampworking, ceramics, jewelry design, silversmithing, painting, bookbinding and alteration, and much more that I can’t remember. Each studio is well-equipped and well-designed. The staff is enthusiastic, and each studio has an open door; teachers and students alike are excited to discuss their projects. The collaborative and creative energy is certainly contagious. If and when I head back to Dallas to teach another class, I’m sticking around for a while to be a student, and take advantage of the wealth of information and equipment at the Guild! Many thanks to my generous hosts/ students/ friends for making the trip to Dallas such a wonderful one!